CPR is known as Cardiopulmonary resuscitation. It is an emergency procedure that combines chest compression often with artificial ventilation in an effort to manually preserve intact brain function until further measures are taken to restore spontaneous blood circulation and breathing in a person who is in cardiac arrest. It is indicated in those who are unresponsive with no breathing or abnormal breathing, for example, agonal respirations. Folding cushion mask for patient comfort. Oxygen inlet for the therapy of oxygen supply in an emergancy. 15mm OD connector to use with the manual resuscitator. Disposable ,detachable one-way valve with 3M filter to prevent cross contamination. Each pcs packed in a compact shell case, PVC glove, Large carried case, clip on the back of case. Latex free & Single use. 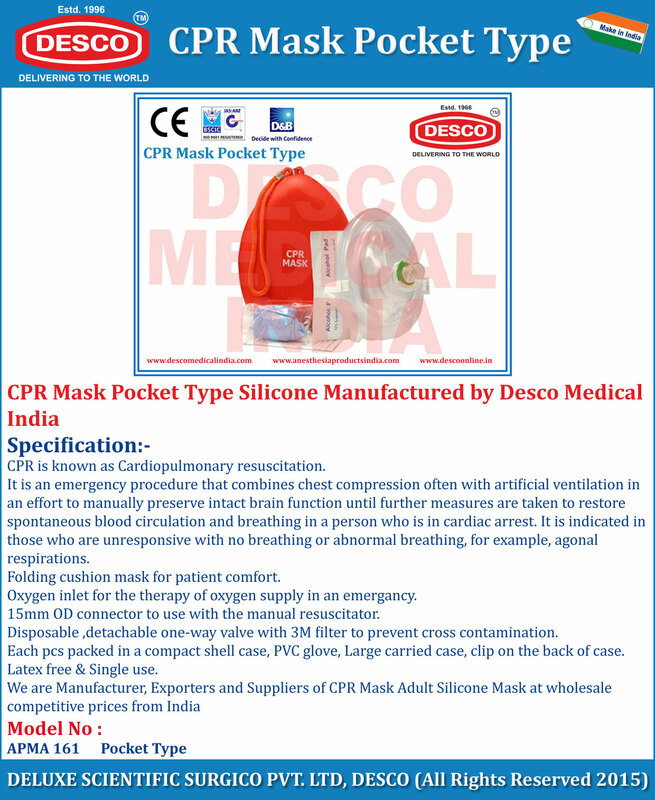 We are Manufacturer, Exporters and Suppliers of CPR Mask Adult Silicone Mask at wholesale competitive prices from India.